With all the class warfare rhetoric of late, a popular “subsidy” to knock of late is the mortgage interest tax deduction. One of the largest constituents arguing for removal of this tax deduction is of course – renters. See renters often cite the notion that they are in effect subsidizing homeowners by way to the tax deduction they enjoy. Renters pay rent which is a pure expense. Homeowners both build equity through their mortgage principal payments and they also get to deduct the interest portion of their mortgage payments annually (as well as real estate and school taxes). Since renters and homeowners alike are taxpayers, the thinking is that it’s a transfer of wealth from renters to owners. Fair enough – until you dig a little deeper. Stability, Community, Intangibles – Many people remain in the same rental unit for years. However, if you knew going in you were going to be staying in the same area for decades, you might be more inclined to buy. One of the oft-cited benefits of renting is the flexibility of mobility – for employment, family, whatever the reason. Homeowners tend to be less mobile given the transaction costs. As such, homeowners tend to contribute more to the local community – they have a vested interest! This is a general statement, not based on anecdotes. Think about it. If you’ve been part of a community for 20 years, you’re probably more involved in the schools, sports, town hall meetings, volunteering, etc. If you move every year or two, is it worth your while to get entrenched in town issues? Risk of Loss, Fees -Homeowners face risk of loss when buying a home whereas renters don’t. They pay multiple fees and taxes to buy a home. When I buy and sell a home, I pay a 1% transfer tax each way. This is money that goes into the municipal budget. Shouldn’t homeowners have a tax benefit for the risk of loss they face and the contributions to the community and economy by way of transaction fees and taxes paid? It’s kind of like the lower capital gains rate investors pay compared to W-2 income. It’s meant to encourage at-risk capital investing as opposed to just squandering everything. 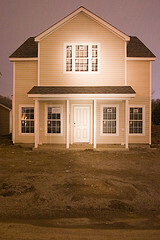 Shadow Stimulus – Homeowners stimulate the heck out of the economy compared to renters. As a renter, you’re not supposed to be hanging stuff on the wall let alone doing upgrades to the home. Over the past few years, I’ve put in a new kitchen, a new patio, new appliances, landscaping and more. Renters don’t invest in the rental property – why would they? And landlords? They do the bare minimum to get by. They’re in business to optimize their profits, not make the renter happy. Take a look at the annual revenues of Home Depot, Lowers and the thousands of small business contractors – It’s well into the tends of Billions of dollars annually. This is a hidden stimulus brought to you by – homeowners. Not renters. Renters Pay Lower Effective Tax Rates – This one’s not obvious, let me explain. At first glance, you might say, “Wait, I rent and I don’t have to pay taxes at all. haha.” Well, your landlord pays real estate and school taxes. That is priced into your monthly rent. They’re not paying it for you out of the goodness of their heart. So, you’re paying taxes. However, net-net, in a given area, rental units are generally appraised much lower than a typical single family home for varying reasons (size, multi-unit, age, etc). As such, as a renter, you enjoy the accouterments of everything the local municipality has to offer, but at a lower price. The homeowners are subsidizing the renters. In the interest of disclosure, I’m a homeowner. I’m actually somewhat agnostic of the loss of the mortgage interest deduction IF we saw a mass elimination of tax deductions and credits across the board with a new, lower tax rate to offset the loss, as outlined in the deficit panel recommendations that broke recently. If the entire country is seeing some sacrifice universally and the tax code becomes less convoluted, then fine. At the end of the day, I may be out a thousand bucks per year, but it won’t put us in the poor house. This wasn’t a post about whether you’re better off renting or buying, but rather just trying to point out that the current mortgage interest deduction isn’t necessarily the giveaway the pundits and class warmongers would have you believe. It’s likely the other way around. Homeowners tend to contribute more than renters to the local community? Perhaps, perhaps not. According to the National Multi Housing Council, a nationwide organization of apartment owners and managers, single-family homes (where homeowners live) have about twice the rate of kids in school (think vast community expenditures) than do apartments. Oh, and looky here…are you familiar with the numerous state property tax caps and limitations – like California’s Proposition 13 – which either lock in assessments (as in California) or limit annual increases, until the property is sold? When a ‘capped’ or ‘frozen’ property is sold, the property is reassessed to current value, and the property taxes soar to catch up to current values. The shorter holding period – and more frequent sale – of rental properties – drives up the share of property taxes they pay. A study several years ago in Michigan – which caps annual increases in taxable value – suggested that (because the rentals were sold and tax-revalued more frequently) rental properties had 20 percent more taxable value than comparable owner-occupied homes. More subsidy from renters to homeowners. There’s no denying the shadow stimulus of homeownership, but as an involuntary renter, I view it as irrefutable evidence of my victim status as an involuntary renter – see, my rent is exorbitant but I can’t even pour money and effort into improving my bleak housing – rather than as evidence of homeowner virtue and superiority. @Terry, Very good points. Sorry to hear it sounds like you would have liked to have been a homeowner but circumstances are preventing that. This post wasn’t meant to be a knock on one or the other – I’ve been a renter and an owner before. It was meant to dispel some common talking points I keep hearing repeated on the cable news networks – and the same one-sided argument keeps being made without consideration of the facts presented here. In a dynamic and evolving financial environment (i.e. at virtually all points in time since the Renaissance, or at least since the Industrial Revolution) economic conditions, and specifically the financial positions respectively of renters and homeowners is subject to change. For example, parents of baby boomers who bought homes in the early postwar period typically enjoyed huge appreciation in their home values over a few decades (say 1950s through 1990s). Ultimately political and financial attempts to push the homeownership envelope to unprecedented heights led to a housing bubble which burst and left millions of homeowners underwater in their inflated mortgages. At the height of the bubble – which was the worst time to buy – the financial advantage went to renters, but I think it will soon be back with homeowners. The apparent oversupply of housing is illusory and unsustainable. It is unsustainable because population continues to grow, while new construction has fallen to a trickle. Since new construction entails a several-year process (planning and design, site selection and acquisition, zoning and permitting all must precede the actual construction), in a fully-recovered economy, renters will for several years find a housing shortage and potentially backbreaking rents. I view homeownership not as a ticket to windfall through appreciation, but as a crucial hedge against unaffordable rent increases. I disagree on what caused the bubble, it was the repeal of Glass-Steagall and the Gramm-Leach-Bliley act which allowed banks to pool mortgages into securities, and pawn them off as low risk investments through fake insurance ratings. If you offer people free money, they will take it, that much is certain. You can’t blame stupidity on the people who took the loans without looking at the cause of what allowed Ninja loans in the first place. Who thought it would be a good idea to loan someone over $400K with no income verification? The three senators I mentioned previously. They are the ones that created the investment vehicles which were completely insane, and caused this country to go into a massive recession. Do you blame the person who was scammed by the Nigerian banker who has millions, or do you blame the scam artist? Me I blame the scam artist, others want to blame the people who were scammed, and now are destitute. As for who is better off right now? It is still the renter, and it will be for at least a few more years. If you purchase a home right now, you will have to plan on living in it for 20 years to get your money back. The price of homes will eventually go up, but not for a long time. Look at the history of real estate market crashes, and what happens over time. Read John Maudlin and what he has to say. There is another 10-15% drop that is needed to hit historical norms, and there is always an overshoot on the way down. There currently is an inventory of 2 years, with a shadow inventory of another 2million homes which will be foreclosed on. Times can change quickly. Portland today has the lowest rental vacancy rate in the country, and (depending on whom you ask) rents are up 8 to 10 percent over the same time last year. Also, a rent-buy comparison suggests that in Portland, rennting is now 18 percent more expensive than buying. Renters are hosed for the long term. To fix the problem, it is simple, return the tax break back to renters before Reagan eliminated it in the 80’s. That had more of an effect on destroying the working class than other things did, because it effectively took away over $10K in deductions every year. As for homeowners pay a less effective tax then renters? Didn’t you just claim in another blog that you were paying on the order of an effective 5% in taxes? Kind of talking out of both sides of your mouth don’t you think. As being a homeowner, and a renter, I can say unarguably that my effective tax is cut in half when I own a home compared to when I rent. I went from paying an effective 15% tax to an effective 28% tax when I went from a home owner to a renter. It wasn’t because of a bad investment, but a divorce and I left her the house. It crippled me financially, as not only was I building equity, I was also enjoying a nice $30K write off from what I made, not to mention the other things that I was able to deduct. . home improvements, donations, student loans, property tax and other things that individually didn’t add up enough to itemize my taxes after I started renting. To top it off, I moved out in 06, so I had no choice but to rent. If I bought then, I would be screwed, and I have waited out the market for almost 5 years now. In those 5 years, there is at LEAST over $180K in writeoffs I left on the table by not owning. To say renters pay a lower effective tax rate than a homeowner is not only intellectually dishonest, it is a complete and abject lie when facts are faced. @Michael Harris, As I recall, that was a 7% effective FEDERAL tax rate and the article was expressing criticism have having such a low rate. I was saying renters pay a lower local tax rate. Apples and oranges. Don’t forget, 47% of Americans paid NO Federal taxes last year, so renters who don’t even pay Fed taxes at all-should they really be conplaining about tax writeoffs for homeowners? But you should re-read my article before calling me a liar. I actually said I’m agnostic on the loss of the deduction anyway. Are you really arguing that no subsidization exists? Your points, as I read them, only suggest that subsidization is worthwhile. I think otherwise, but generally prefer market mechanisms to economic engineering. That said, I’ll continue to take the tax break as long as its available to me. Whether you agree with it or not, part of the taxpayers (homeowners) get hefty tax breaks on their housing payments, and part (renters) do not. By definition, isn’t that subsidization of the favored activity? @microcap speculator, I don’t think the point of this post was to state that no subsidy exists, but rather to be devil’s advocate. The only position regarding this issue most people hear today is how lucky homeowners are to receive this incentive. As with any complex issue, there are many consequences that no one thinks of until after the fact. For example, eliminating the mortgage interest deduction (MID) would create a higher rent immediately as the owners of property adjust rents to recoup the higher cost. Renters who believe they are leveling the playing field by supporting repeal of the MID may find they do not like the results as much as they liked the sales pitch. Regardless, it is nice to hear a different view (whether you agree with it or not). Interesting discussion. I can say renters will be paying 3.8% more because of the new medicare tax that goes in effect 2013. Don’t think for a minute landlords won’t pass the increase in taxes on to their renters. How come landlords pass on tax hikers to renters but not tax cuts? Shouldn’t it go both ways? The impact of tax breaks from mortgage interest deduction are overestimated by most. About 30% of homeowners have no mortgage. Of the roughly 70% of homeowners with some form of mortgage only about 80% of them itemize their deductions. So about 55-60% of homeowners get a tax break on their home mortgage interest/property taxes. That means that 40-45% of homeowners get NO tax break from home mortgage interest. Landlords get tax breaks which are built into the rent. Landlords get mortgage interest deduction, property tax deduction, depreciation deduction (big one) and are allowed to deduct any applicable expenses for the property. These add up to a lot and help to keep rental costs down. I’m a landlord and I definitely consider the tax consequences of my rentals and it makes a big difference. And at the same time landlords pay taxes on the property and its profits as well. Built into the rent? HAHAHAHAHAHAHAHAHAHAHAHAHAHAHAHAHA! Home prices are going lower still – only now the banks won’t give the responsible renters who sat out the market the loans to buy. We still get to rent at outrageous prices – probably from the people our taxes helped bail out – we’re now paying rent for their outrageous mortgages that they spent way too much on as well as the property taxes that have gone through the roof to counter balance it and the new trash pick up fees and the water bills (which used to be inclusive in the rent) – so glad I can not only help out irresponsible homeowners with my taxes but now be forced to rent from them at absolutely outrageous rent to make up for it!!!!!! Where is my American dream? Responsibility doesn’t pay in this country – guess I should have bought way back when – and now I could be renting out the mortgage I can’t afford to some idiot like myself who tried to do the right thing, going on vacations and only working part time while accumulating equity on the back of my renter…Thanks government for helping out those who truly deserve it.